14 great DIY Valentine gifts for you to make for that special someone. 14. Quilled Cards are so Pretty! There are a ton of ideas to make your own gifts. I personally think that all Valentine gifts should be hand-made and come from the heart – there is no need for commercial gifts to say I love you. These are super cute (though less tasty than a Chinese fortune cookie). Fill up some felt fortune cookies filled with messages of love. Give out Valentine treats is these adorable little bags. The bags can be re-used for many things afterwards. 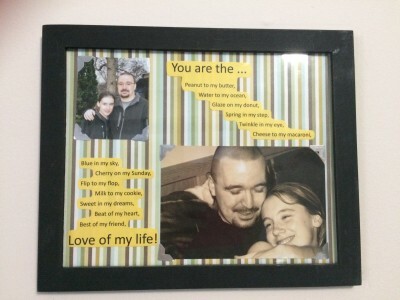 I’ve created the hubby some little keepsakes to show him I love you. I have picture up small wooden plaques or boxes from the local dollar store (or a craft store). I’ve transferred photos onto wood and woodburnt on some decorations and love notes. Learn how to transfer photos onto wood. The process is simple, and it makes sure a beautiful picture. Much more unique than simply framing an image. I love the look of wood and adding these photo transfers makes for a very special little gift. Flowers that will never wilt! These little pom pom flower bouquets are super cute! Nothing is more relaxing than a bath, especially with bath bombs or bubbles. Make some home-made bath bombs as a Valentine gift. This is a simple one I’ve done for the hubby in the past. Write or pick a simple poem. Print it out. Pick a few of your favourite pictures. Place them on a nice background and frame it up for your love. Who doesn’t like lollipops. Arrange them into a cute bouque of lollipop flowers for your special someone. I am in the process of doing this with some flowers I got from the hubby. It is an awesome way to perserve flowers. I can never turn down cheesecake. These are super sweet conversation heart cheesecake. These are the days I wish I could have wreaths on my door, but winter keeps me from it unfortunately. These Valentine wreaths from 36th Avenue are so pretty! Red velvet, yum! These are festive Valentine cookies and sound like a tasty treat. Get the recipe here. Paper quilling is on my crafting bucket list. These quilled Valentine cards are a great home-made card – much nicer than buying a card. I hope some of these DIY Valentine Gifts help you show your feelings for the ones you love. Join us on Facebook and show us what you create!